A great appetizer to enjoy while tailgating or watching a game at home with friends; or as a welcome addition to the buffet table at your next party! Enjoy with Peach Creek Sassy Lassy, Fireside, or Audacious Wines! Crostini: Preheat oven to 375 degrees. Brush baguette slices on both sides with olive oil and season lightly with salt & pepper. Arrange on a baking sheet and bake until crusty, approximately 10 - 15 minutes (depends on how dry the bread was initially and how close together they are on the baking sheet). Turn once about halfway through cooking, and dust with Pecorino-Romano Cheese Blend. Cool completely. Blend the softened goat cheese and cream cheese together until combined and smooth. Spread this over each crostini. Top with diced chorizo and tomatoes. 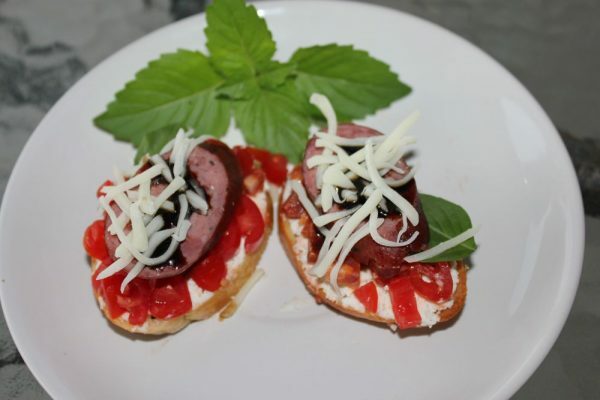 Cook Andouille Sausage in a saucepan with a small amount of white wine or water, let it cool (so it doesn't cause the creamy cheese blend to melt), and then place a slice on each crostini. Drizzle with homemade Balsamic Vinegar Reduction (instructions below), and top with shredded mozzarella cheese and/or chopped basil, as desired. Homemade Balsamic Vinegar Reduction: Heat approximately one cup of balsamic vinegar in a small saucepan over medium high heat. When it reaches a boil, reduce and simmer, stirring occasionally, for about 10 minutes or until it will coat the back of a spoon. Remove from heat, cool and use, or refrigerate in an airtight container.